Having made 4 good size quilts in January, I decided my next project would be a small doll quilt! I was given a stack of 2 1/2 inch squares as part of a Yankee Swap over the holidays. And I had a few left over white 10 inch layer cake Kona®squares which I cut into 2 1/4 inch strips. The 2 1/2 inch squares were pinked so 2 1/4 inches was a better match. I haven't picked a backing or binding yet but I know I'm going to quilt it with straight line quilting. It's a sweet little piece! Working on the "Snow Melt" quilt on a snowy day! The irony that I was working on my "Snow Melt" quilt on a day when it was snowing (again!) was not lost on me! But the the silk screened of crocus card that I made years ago, tucked into my ruler stand, added a hopeful feeling to the day! Here are a couple of pictures of the quilt top and back. I can't decide which I like better! It was very windy the day I took these photos. The only place I could keep the fabric still was draped over the deck railing facing the wind. Part of the quilting I'm doing on this project is grid work. I've used an pastel sea green thread for most of the stitching. At the moment I'm adding diagonal quilting with yellow thread--sun beams! My diagonal yellow stitching extends over 1/3 of the quilt. I used painter's tape to mark the first line of diagonal quilting. Additional lines of quilting are stitched using the marking lines on my walking foot, following the first line of diagonal stitching. The painter's tape works really well. It doesn't leave any sticky residue. However I wouldn't put the tape on a quilt and leave it there for more than a day. I've read that masking tape will leave a residue of glue on the fabric so make sure you use only use painter's tape. Here's a photo of diagonal quilting using painter's tape as a marking line on the "Early Birds" quilt that I just completed. After a winter with unusually heavy snowfall, Massachusetts is just starting The Long Melt. (Can Mud Season be far behind)? While some years, March here does seem like the beginning of spring, this year the landscape reminds me of low volume quilting fabrics: Mostly white with a bit of color. After watching part of Cheryl Arkison's class, "Quilting with Low Volume Fabrics" on CreativeLive, and looking again at her book, A Month of Sundays, I decided to try making a quilt with just low volume fabrics. A low volume quilt perfectly echoes the world outside my window. What are low volume fabrics? Cheryl describes them as white or light colored fabrics with a colored design OR a colored fabric with a white design. "Low Volume". It's a term created by, and only used by, quilters. Unlike most other design and color terms, this one isn't used in the art world. I also think of low volume fabrics as light colored fabrics with some design and which are especially well suited for backgrounds in quilts. These fabrics have color, but it's understated. Making a whole quilt with low volume fabrics is a challenge. You need to pay attention to value so the quilt isn't flat looking. Cheryl uses the "X Plus Block" in her class. I didn't want both an X and a plus sign in my blocks. So I modified the pattern, keeping the plus sign but changing out the X for a small fold-over triangle which will create a secondary pattern of small diamonds in the negative space of the joined blocks. Above are four of my blocks. I've laid them out on a snowbank. They have the pale blues, green and lavenders of the snow and it's shadows and then the light yellow block, like the March sun, whispering of warmer, brighter days to come. 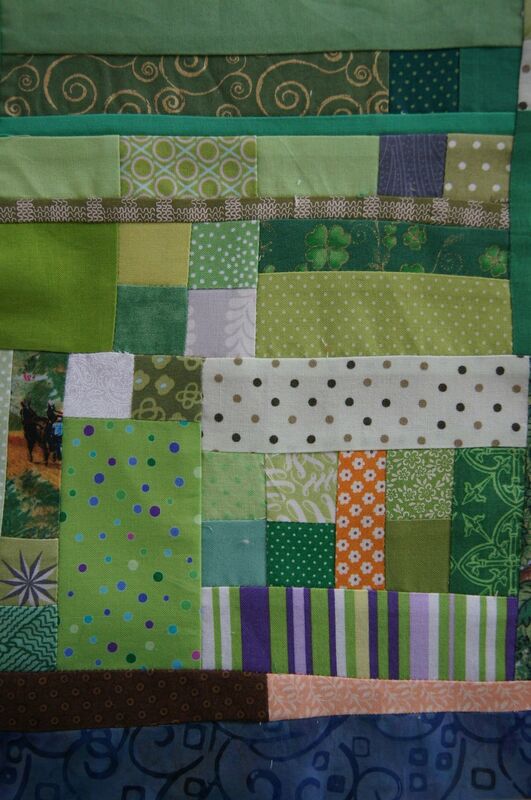 Irish Mini Quilt "40+ Shades of Green"
Irish Mini Quilt 9 3/4" x 11 3/4" "40+ Shades of Green"
With St Patrick's Day just around the corner, I made a little Irish Mini quilt. Ireland: ocean, beach and green hills. 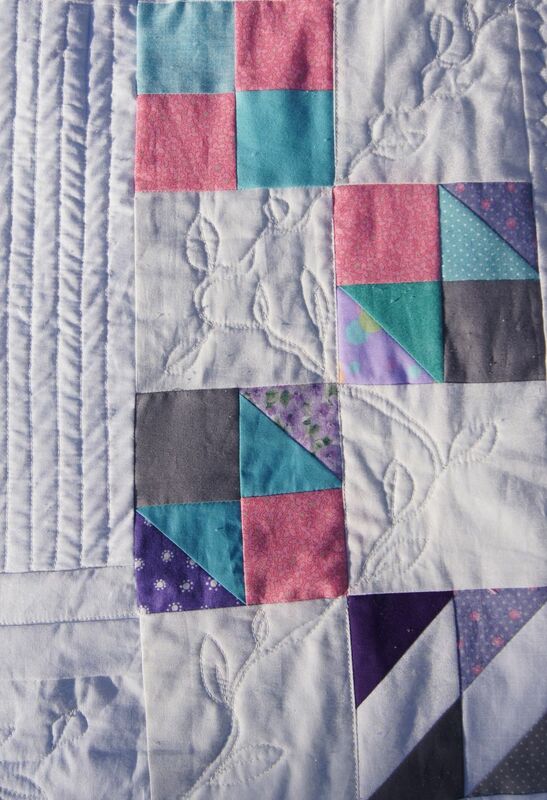 There are three 1 inch blocks in the upper half of the quilt that run almost on a diagonal. White, light grey and dark grey, these blocks are symbolic sheep on the hills. There's a realistic horse pulling a wagon on the far left if you look, a couple of shamrocks too! 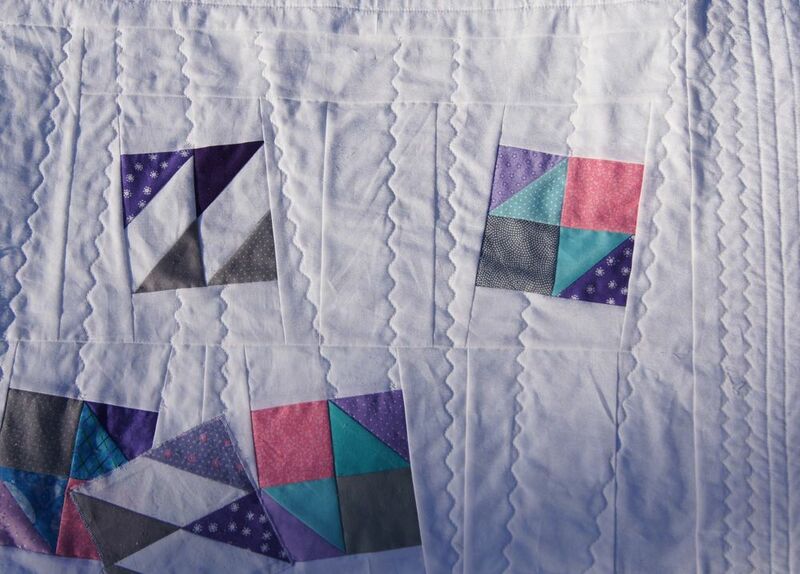 This mini quilt was totally improv pieced. I pulled most of the fabrics out of my bag of strings. The rest of the pieces came my collection of pre-trimmed scraps, 1 1/2 inch squares and 2 inch squares. Because the piecing was truly improv, the completed top was off kilter. (It was more off kilter than shown in the picture below! The tilt bothered me enough that I only took a detail photo of the top!) I wasn't at all sure this little quilt was going to work. But once I started quilting the curves of the hills, it was just fine! While the celebration officially isn't until next Tuesday, it's never too early to wish you a Happy St. Patrick's Day! 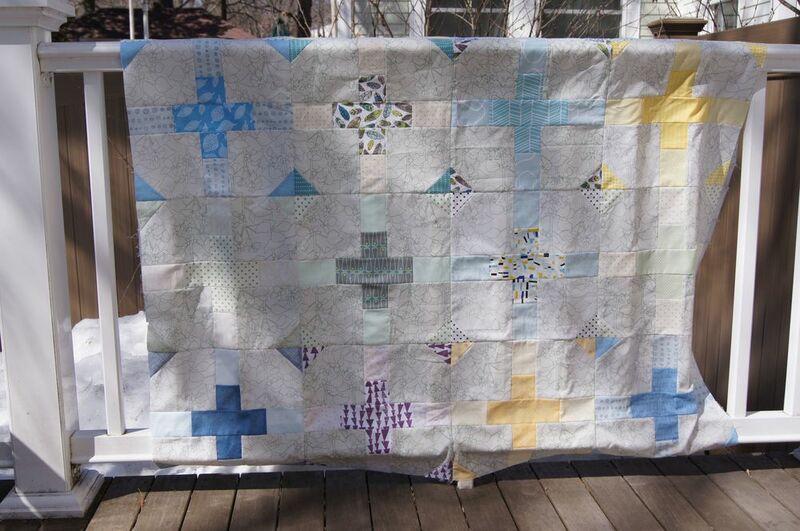 If you've been a long-time reader of my blog, you know that my friend Janet Hanley and I designed a quilt as a fund-raiser for the Somerville Homeless Coalition. Members of the Proper Bostonian Quilters Guild joined us in making the star blocks for the quilt. Some of the stars have a log cabin block as the central block. 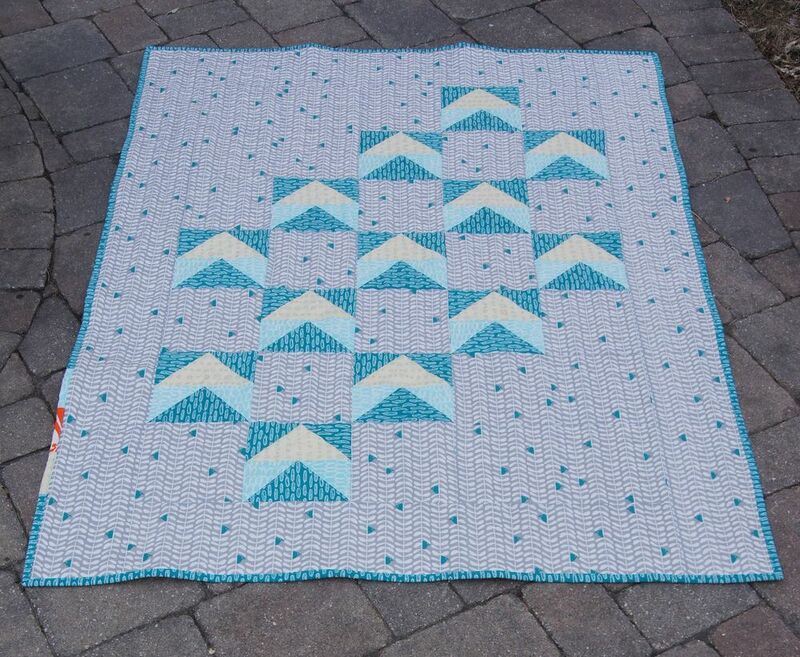 It's a delightful design and the quilt's colors are bright and cheerful. Janet sewed the completed blocks of the quilt together and we quilted it on a long-arm at Bits n' Pieces Quilt and Fabric Shoppe in Pelham, NH. The Burren Backroom Series, with Brian O'Donovan of WBGH's Celtic Sojourn, is hosting a funding raising event for the Somerville Homeless Coalition in Davis Square, Cambridge, MA on December 3, 2014. They are selling raffle tickets for the quilt now and the drawing will be done that evening. Click on the link above and scroll down the page to the Benefit for Somerville Homeless Coalition to see some of the fabulous musicians who will playing that evening. You may also purchase tickets to this gala musical event at the link above. If you wish to participate in this quilt raffle click this link to purchase tickets on-line. Tickets will also be available at the event December 3. Please do share this post on Facebook, Twitter or other social media if you have friends who love quilts and would be interested in supporting the Somerville Homeless Coalition. Thanks so much for your support!